This entry was posted in Blog and tagged Electric Piquete, guanabanas, jupiter, noche latina. Bookmark the permalink. 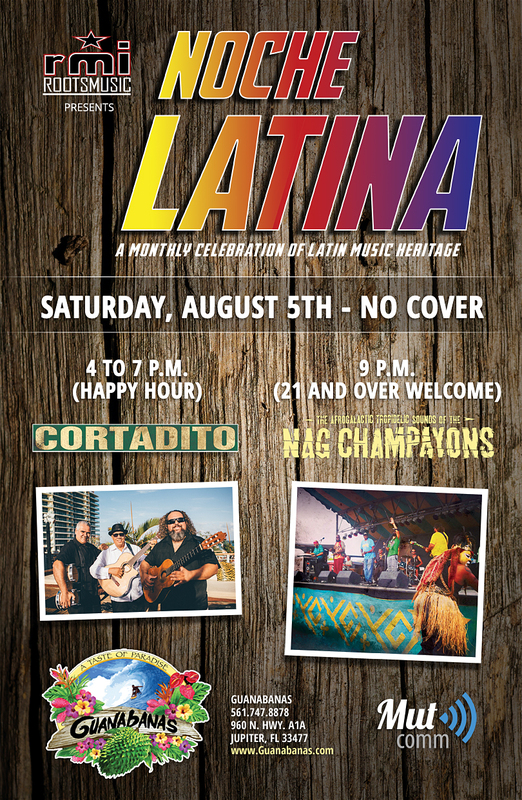 Jupiter, FL – August 6, 2018 – Noche Latina, the monthly Latin music series at Guanabanas Island Restaurant & Bar (960 North Highway A1A, Jupiter, FL 33477), returns on Saturday, August 25, 2018, beginning at 4 p.m. and will feature Cortadito (Cuban folk), the Nag Champayons (Afro-Galactic / Tropidelic), and DJ Ephniko (multi-cultural tunes). Experience the best South Florida-based Latino music acts in an enchanting, outdoor setting on the Loxahatchee River. 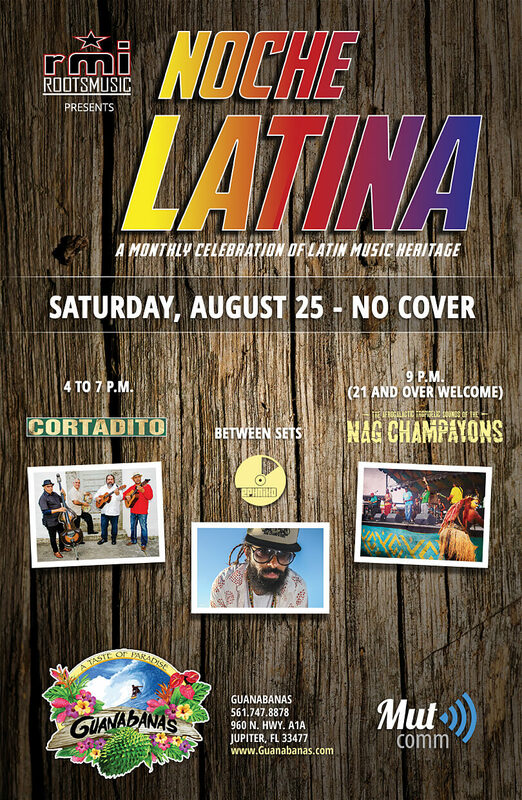 No cover, all ages welcome to the early show; 21 and over after 9 p.m.
“The double bill of of Cortadito and the Nag Champayons is an excellent mix that our loyal Latin music fans very much enjoy,” says Guanabanas talent buyer Matt Cahur. “The combination of Cuban folk and spaced-out Miami funk is a potent one, and adding Ephniko to the mix means we are in for quite a flavorful afternoon and evening.” Cahur is the head of Roots Music, Inc., which for 20 years has offered music management, production and promotions services out of Jupiter. Cahur is also the master sound engineer at Guanabanas. From inception, Cortadito’s focus has been performing the traditional Cuban music of the early 20th century: the Son Montuno, Guaracha, Boleros, Nengon, and Bolero Son styles. This dynamic ensemble brings the listener back to a time when Trio Matamoros, or Ignacio Piniero ruled the Cuban music world, and when Son Montuno was influencing music throughout the globe. From time to time, Cortadito is backed by a variety of guest musicians, which gives the group a sound reminiscent of the Buena Vista Social Club. Learn more at www.CortaditoSon.com. They are celebrating the release of their latest CD, Canciones de Julio. Miami’s Afro Galactic / Tropidelic funksters the Nag Champayons blend African, Caribbean and North American influences into a unique and extremely danceable sound. They continue to play local and regional music festivals, and are currently in the studio recording new music. Their most recent release is the single and video for “Brazilian LSD”, which served as a follow up to 2015’s masterful Rising Sounds of a Sinking City, a darkly serious and ominous 21-minute environmentally-conscious theme. For more details, visit www.NagChampayons.com. Ephniko is the front man for the Nag Champayons, but he is also a very in-demand world music selector. The Baranquilla, Colombia-born MC approaches crowds as a rhythm shaman looking to heal their stress and sadness by taking them on a journey. He does so by combining tribal-like acoustic sounds from folklore all over the world with the electromechanical vibrations of the first world inner cities where he found his musical voice. There is no cover; 21 and over are welcome after 9 p.m. For more information, please call 561.747.8878 or visit www.Guanabanas.com. Guanabanas’ food truck can be booked for any event by calling 561.747.8878or emailing foodtruck@guanabanas.com. This entry was posted in Blog and tagged guanabanas, jupiter, noche latina. Bookmark the permalink. 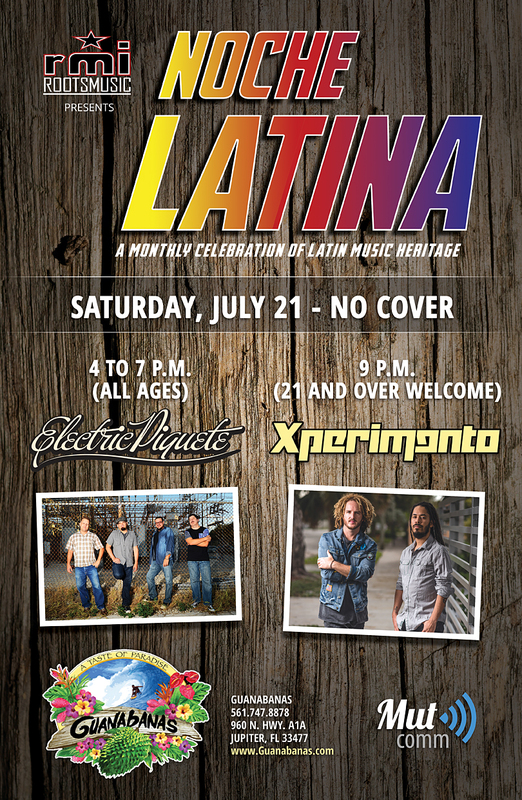 Jupiter, FL – July 9, 2018 – Jupiter, FL – July 9, 2018 – Two bands from Miami will bring a musical summer sizzle to the Guanabanas Island Restaurant & Bar stage Saturday, July 21, 2018: two-time Miami New Times “Best Latin Band” Electric Piquete (4 p.m.) and the Grammy-nominated Xperimento (9 p.m.), marking the debut for the latter. The monthly Noche Latina music series is going on its third year and features some of South Florida’s top Latin music talent at the sublime waterfront venue. Guanabanas is located at 960 N Hwy A1A, Jupiter, FL 33477. No cover, 21 and over welcome to the evening show. “This month’s lineup promises to be quite a spectacular experience for fans of Latin funk and reggae,” says Guanabanas talent buyer Matt Cahur. 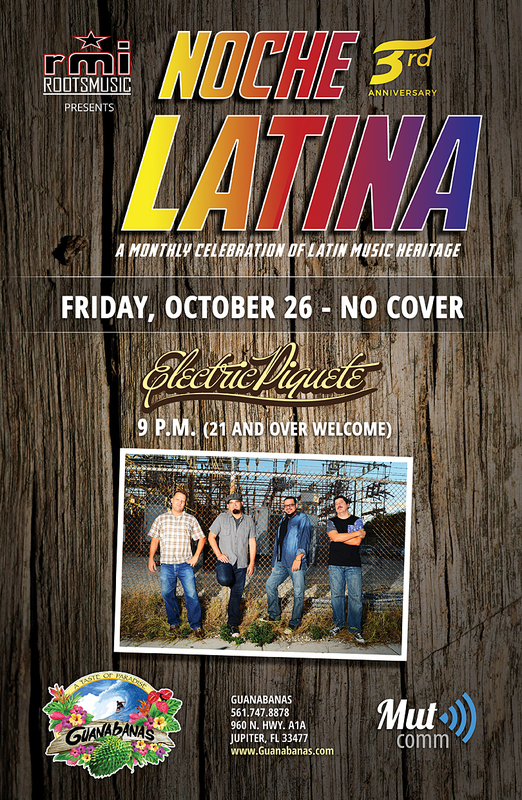 “Electric Piquete are a cornerstone in our Latin Night programming, and they never disappoint. I’m excited to welcome Xperimento and their extremely talented musicians to the fold, and I’m looking forward to sharing their multicultural vibe.” Cahur owns and operates Roots Music, Inc., a Jupiter-based music promotions company active for more than two decades. He also oversees the live music bookings at Guanabanas and is the venue’s lead sound engineer. Electric Piquete is a veritable melting pot of musical goodness, borrowing heavily from the early 70s Latin soul / Fania All-Stars sound, enhancing the groove with American funk and rock influences, mixed in with some jazz sensibilities. The mostly instrumental band mixes original music with inventive interpretations of standards, and uses improvisation as a vehicle to take listeners on a Afro-Caribbean journey of sound. They are set to enter the studio later this summer to produce a full-length recording. More details: www.ElectricPiquete.com. Xperimento blends world sounds such as Cumbia, reggae, ska, Salsa, Merengue, Dembo, Kuduru and funk with elements of rock, R&B, hip-hop and dancehall. Members of the band have recorded and performed with world-famous artists including Prince, Enrique Iglesias, Ricky Martin, Fonseca, Paulina Rubio and Alejandra Guzman to name just a few. Their debut album Second Floor continues to make fans dance, as the band tour and continuing to self-produce their highly-anticipated third album. Learn more here: www.Xperimento.com. Guanabanas is gearing up to celebrate its 10th anniversary with an exciting new announcement coming soon. They continue to offer a weekend brunch buffet, and have a food truck and catering services available. Guanabanas’ award-winning menu features breakfast, lunch and dinner items, all locally-sourced and unbelievably fresh. Signature cocktails include the Coconut Mojito, a Mango Beach Break, and the Guanabanas’ Cat 5; their wine list only contains labels produced in an Earth-friendly manner. 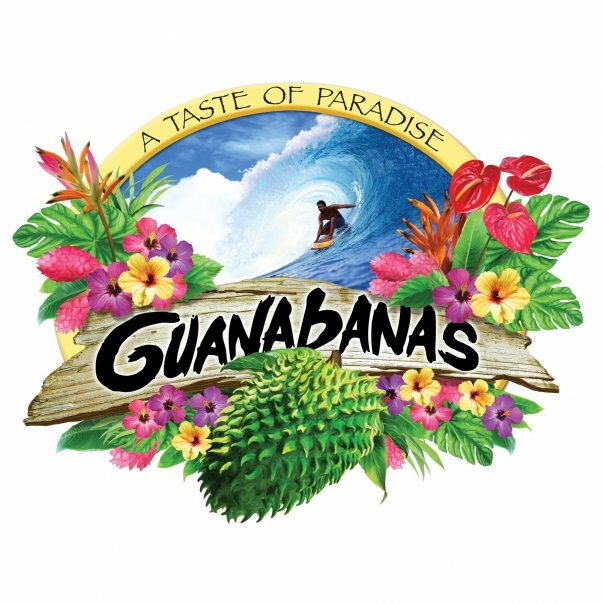 For more information, please call 561.747.8878 or visit www.Guanabanas.com. This entry was posted in Blog and tagged Electric Piquete, guanabanas, noche latina. Bookmark the permalink. Latin Night is Back at Guanabanas! Jupiter, FL – March 14, 2018 – The monthly Noche Latina series returns to Guanabanas Island Restaurant & Bar on Saturday, April 7, 2018, featuring two prominent Miami area groups and a world music disc jockey. First up DJ Ephniko spinning during brunch, followed by the Pepe Montes Trio led by its namesake piano prodigy, and will mark the return of Locos Por Juana, the Latin urban orchestra that has found success with area music fans locally and on a national level. There is no cover to attend at any time; 21 and over are welcome after 9 p.m. The venue is located at 960 North Highway A1A, Jupiter, FL 33477. “Locos were a hit at the last Dirty River Reggae Festival, as well as during their debut a year ago,” says Guanabanas talent buyer Matt Cahur. “They are the perfect embodiment of Noche Latina – bilingual musicians on a quest to spread a multi-cultural message of love and unity through music. I’ve had my eye on Pepe for a while now, knowing full well he’s a Cuban musical force to be reckoned with.” Cahur runs Roots Music, Inc., a Jupiter-based, 20-year music management and promotions company, and is the lead sound engineer for Guanabanas. 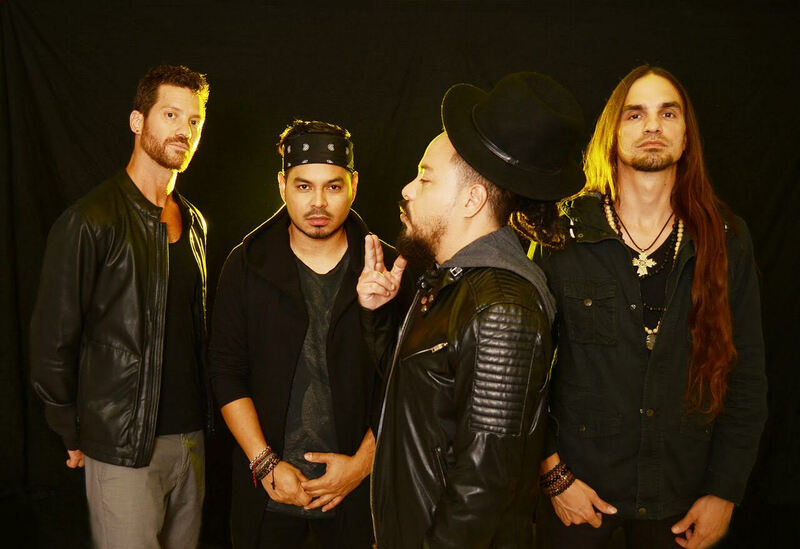 Formed in 2000, Locos Por Juana pedal a style of music that is as varied as South Florida is: they mix musical influences from Miami and the Caribbean islands including reggae, Raggamuffin, and dub from Jamaica with hip-hop, rock, and funk. The group’s latest release Caribe, featuring several high-profile international guest artists including legendary rapper Talib Kweli, ChocQuibTown, Marina (Ojos de Brujo), has led them on a national and international touring jaunt since its release. Grammy and Latin Grammy-nominated, Locos are getting set to drop a new single called “Tal Vez / Someday”. More info available at www.LocosPorJuana.com. Pepe is probably best known for his 2013 Latin Grammy win for the live all-star recording called “Salsa Giants”, but he’s also already worked with Marc Anthony, Andrea Bocelli, Laura Pausini, Celia Cruz All Stars, Sergio George, Chino y Nacho and others. He fronts a larger big-band version of his group and is a house musician of Miami’s premiere live music venue Ball & Chain. The keyboardist, composer, singer and songwriter occasionally backs other Miami-area groups, including Electric Piquete. More details: www.facebook.com/PepeMontesConjunto. DJ Ephniko, AKA Alvaro Cuello, is a member of the Nag Champayons, who are regular Noche Latina performers, and a founder of the Patacon Conspiracy, an eclectic outfit that blends world beat, hip-hop and Nu Cumbia. He will also spin during the break between Montes and Locos. This entry was posted in Uncategorized and tagged guanabanas, jupiter, latin music, noche latina. Bookmark the permalink. Jupiter, FL – March 28, 2017 – Now well into its second year, Guanabanas Island Restaurant & Bar’s Noche Latina (Latin night) series showcases prominent local, regional and international Latin music acts on a monthly basis. 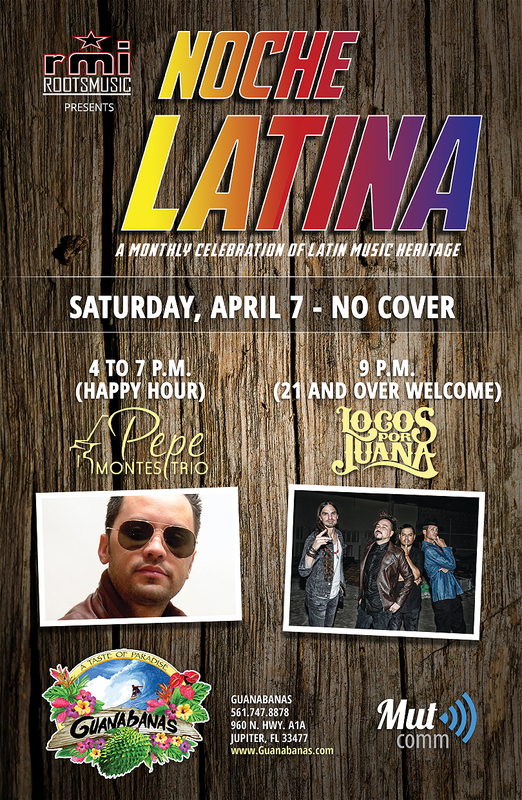 On Saturday, April 8, series mainstays Electric Piquete will perform three sets of Latin funk from 4 to 7 p.m. during happy hour, and the Grammy and LatinGrammy-nominated Miami reggae / fusion act Locos Por Juana takes the stage at 9 p.m. Both shows are free and open to those 21 and over. “We’re very excited about Locos Por Juana’s first-ever performance here at Guanabanas,” says talent buyer Matt Cahur. “Their brand of Latin reggae has earned them fans throughout the U.S. and South America, and we are looking forward to their energetic live vibe. The last time Electric Piquete played happy hour, the crowd was left wanting more.” Cahur’s marketing and promotions company Roots Music has been organizing and coordinating reggae events for nearly 20 years. 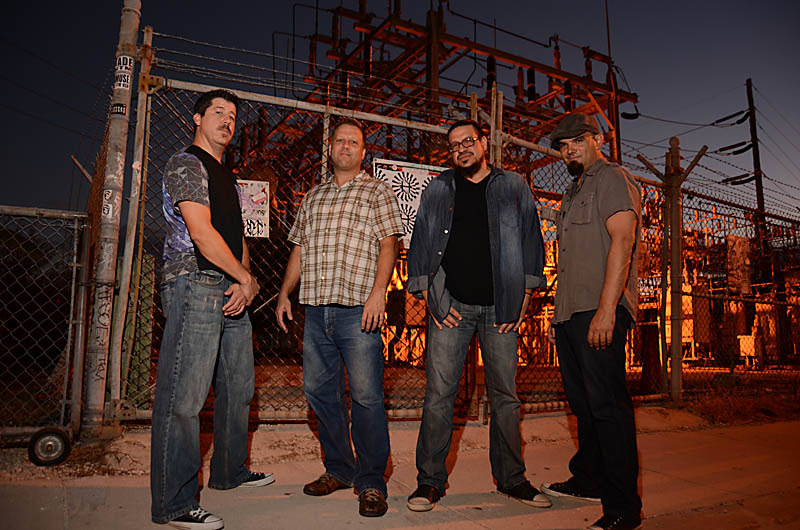 Electric Piquete, two-time Miami New Times “Best Latin Band” award-winners, fuse rock, jazz, funk, Afro-Caribbean, progressive and R&B influences with incendiary results. Last summer they issued their “Singles Collection” digitally and on CD, and released a video for their single “Cut Me Loose”. The band dazzled their audience during their return to the Carnaval on the Mile earlier this month in Miami. More information: www.ElectricPiquete.com. Formed in 2000, Miami musical powerhouse Locos Por Juana, fresh off headlining slots at the Coconut Grove Arts Festival and GrassRoots Live!, as well as their fifth annual Locos Por Marley tribute concert, are promoting their latest release Caribe. The album features many high profile international guest artists including legendary rapper Talib Kweli, ChocQuibTown, Marina (Ojos de Brujo), and more. Their new single “For the Ladies” features Kweli. Learn more about the band at www.LocosPorJuana.com. Guanabanas is located at 960 North Highway A1A Jupiter, FL 33477. For more information about the venue, please visit www.Guanabanas.com or call 561.747.8878. This entry was posted in Blog and tagged Electric Piquete, guanabanas, jupiter, locos por juana, noche latina. Bookmark the permalink.